St Faith’s began in 1908 as a daughter church of St Paul’s Herne Hill. The original church, now St Faith’s Community Centre, was never consecrated as the intention was always to build a church and use the building as a hall. In 1924 St Faith’s became a Conventional District and a parish, when the new church was consecrated in 1957. The handsome Edwardian Arts and Crafts style church hall was gutted and whole of the interior rebuilt to provide the present Community Centre , opened by Princess Margaret in 1989. 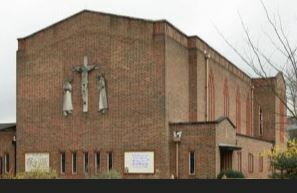 The exterior of the west end is decorated with a sculpture by Ivor Livi of Christ on the Cross attended by St John the Evangelist and St Mary Magdalene. 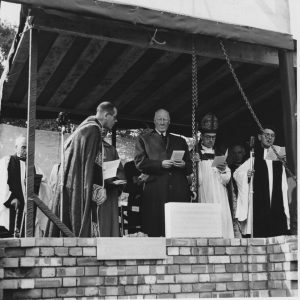 Money from the War Damage Commission a bequest of £2,000 for stained glass windows was transferred from Camden church, Peckham Road to St Faith’s and paid for the beautiful windows in the Lady Chapel in 1958. Laurence Lee, internationally known as Head of the Department of Stained Glass at the Royal College of Art and Master of the Worshipful company of Glaziers designed all eight windows. His work includes numerous cathedrals, including Coventry as well as parish churches.